Camping is an outdoor activity involving overnight stays away from home in a shelter, such as a tent. Typically participants leave developed areas to spend time outdoors in more natural ones in pursuit of activities providing them enjoyment. To be regarded as "camping" a minimum of one night is spent outdoors, distinguishing it from day-tripping, picnicking, and other similarly short-term recreational activities. Camping can be enjoyed through all four seasons. Camping describes a range of activities and approaches to outdoor accommodation. Survivalist campers set off with as little as possible to get by, whereas recreational vehicle travelers arrive equipped with their own electricity, heat, and patio furniture. 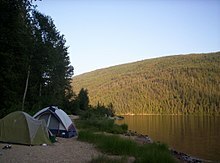 Camping may be combined with hiking, as in backpacking, and is often enjoyed in conjunction with other outdoor activities such as canoeing, climbing, fishing, and hunting. Fastpacking involves both running and camping. There is no universally held definition of what is and what is not camping. Just as with motels which serve both recreational and business guests, the same campground may serve recreational campers, migrant workers, and homeless at the same time. Fundamentally, it reflects a combination of intent and the nature of activities involved. A children's summer camp with dining hall meals and bunkhouse accommodations may have "camp" in its name but fails to reflect the spirit and form of "camping" as it is broadly understood. Similarly, a homeless person's lifestyle may involve many common camping activities, such as sleeping out and preparing meals over a fire, but fails to reflect the elective nature and pursuit of spirit rejuvenation that are integral aspect of camping. Likewise, cultures with itinerant lifestyles or lack of permanent dwellings cannot be said to be "camping", it is just their way of life. The International Federation of Camping Clubs (Federation Internationale de Camping et de Caravanning) was founded in 1932 with national clubs from all over the world affiliating with it. By the 1960s camping had become an established family holiday standard and today camp sites are ubiquitous across Europe and North America. Different types camping may be named after their form of transportation, such as with Canoe camping, car camping, RVing, and backpacking, which can involve ultralight gear. Camping is also labeled by lifestyle: Glamping (glamorous camping) combines camping with the luxury and amenities of a home or hotel, and has its roots are in the early 1900s European and American safaris in Africa. Workamping allows campers to trade their labor variously for discounts on campsite fees, campground utilities, and even some degree of pay. Migrant camps are formed not for recreation, but as a temporary housing arrangement. Campgrounds for custom harvesters in the United States may include room to park combines and other large farm equipment. Another way of describing camping is by the manner of arrangement: reservation camping vs. drop camping. Campgrounds may require campers to check in with an employee or campground host prior to setting up camp, or they may allow "drop camping, where this is not required. Drop-in campsites may be free or a drop-box may be provided to accept payments on the honor system. Although drop camping is often specifically allowed by law, it may also exist in a legal grey area, such as at California's Slab City. Social media oriented towards drop camping provides information on recent police enforcement, campsite quality, cost, and length-of-stay requirements. 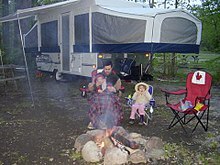 ^ Newspaper article: Camping Provides Active Means of Entertainment which discusses the http://freecampsites.net/ social media website. Another similar website is http://ioverlander.com/.